Anglo-Saxon England is the only publication which consistently embraces all the main aspects of study of Anglo-Saxon history and culture - linguistic, literary, textual, palaeographic, religious, intellectual, historical, archaeological and artistic - and which promotes the more unusual interests - in music or medicine or education, for example. 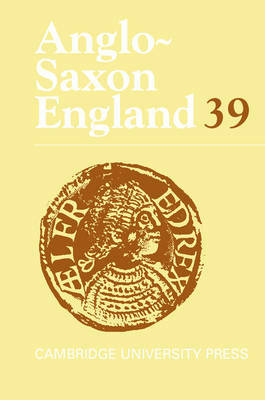 Articles in volume 39 include: 'Why is the Anglo-Saxon Chronicle about kings?' by Nicholas Brooks, 'The Old English Life of St Neot and the legends of King Alfred' by Malcolm Godden, 'The Edgar poems and the poetics of failure in the Anglo-Saxon Chronicle' by Scott Thompson Smith and an article focusing on the new discovery of an eighteenth Agnus Dei penny of King AEthelred the Unready by Simon Keynes and Mark Blackburn. A comprehensive bibliography concludes the volume, listing publications on Anglo-Saxon England during 2009.